Change up your make-up routine for the new season. Now the weather is turning, it’s time to look at your make-up wardrobe and update it for the new season! Don’t worry though, there’s no need to go on a spending spree and buy all new products, it’s just a case of making a couple of swaps. Over summer we tend to opt for mattifying formulas to keep our skin shine-free. With the colder weather comes dryer skin. Swap your foundation for a more hydrating formula that offers a dewy finish. This will give your skin a gorgeous glow throughout autumn. Harsh contouring fell out of favour with fashion designers for this season – now it’s all about the flush of colour. Adding a hint of pink to your cheeks so you look naturally flushed, like you’ve just been out for a country walk, is ideal. Eyeliner is probably already a staple in your make-up bag, but now is the time to get experimenting. The autumn/winter catwalk shows made eyeliner the star of the show, some stuck to bare lids and simple lines while others tried punk-y looking brushstroke effects. Red lips are back with a vengeance (although, let’s face it – they never really went anywhere). 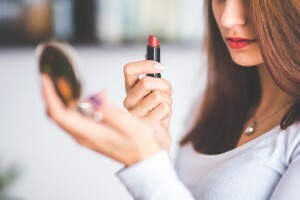 If you’ve never tried red lipstick before, take a look at our guide to picking the right red for you and get shopping! An easy way to transform your look from summer to autumn is to rock some metallic shades on your eyes. Bronze, gold and copper are having a real moment right now – we recommend investing in a palette that contains metallic and matte hues. What changes will you be making to your make-up routine this season? Let us know on Facebook.